President Donald Trump lavished praise on North Korean leader Kim Jong Un after their historic four and a half hour face-to-face meeting in Singapore Tuesday, where the two signed an agreement that offered security commitments for North Korea in exchange for "complete denuclearization of the Korean Peninsula." "President Trump committed to provide security guarantees to the DPRK, and Chairman Kim Jong Un reaffirmed his firm and unwavering commitment to complete denuclearization of the Korean Peninsula," the joint statement reads. 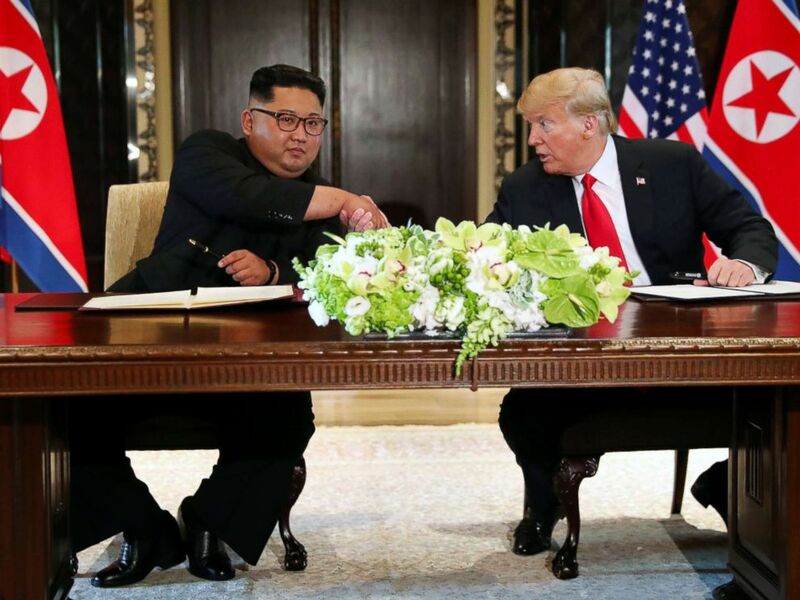 While the document provides no clarity on whether the meeting yielded any new concrete commitments by the North Koreans to dismantle its nuclear program, both leaders hailed the moment as a "historic" turning point in bringing about an eventual end to hostilities in the region. The agreement also tasks Secretary of State Mike Pompeo with meeting with a high-level North Korean official "at the earliest possible date" to "implement the outcomes" of the summit. "Today we had a historic meeting and decided to leave the past behind and we are about to sign a historic document," Kim said. "The world will see a major change. I would like to express my gratitude to President Trump to make this meeting happen." Trump said not only would he "absolutely" be inviting Kim to the White House for a meeting, but he expected the two would meet "many times" in the future. The friendly banter marked the end of one of the most highly anticipated and high stakes diplomatic meetings in a century. But reflecting on the meeting Trump appeared to brush off for the most part North Korea’s dismal record regarding human rights, saying it was only discussed “relatively briefly” compared to the primary goal of convincing Kim to dismantle his nuclear program. In a speech to the United Nations last September, Trump made human rights a key issue in his overall condemnation of Kim Jong Un’s regime. "I feel really great," Trump said. "We're going to have a great discussion, I think, a tremendous success, this will be tremendously successful. It's my honor and we will have a terrific relationship I have no doubt." Kim smiled as he heard the translator interpret the president's remarks, before weighing in with a brief statement of his own. As the leaders sat down, White House press secretary Sarah Sanders tweeted photos showing the U.S. and North Korean delegations meeting in a separate room where they watched a video feed showing Kim and Trump together. Photos showed that National Security Adviser John Bolton was present in the room along with Kim Yong Chol, the high-ranking North Korean military official who hand-delivered a letter from Kim to Trump at the White House on June 1. Bolton has in the past advocated for military action to overthrow the North Korean regime and was more recently a target of searing rhetoric from officials who said in a mid-May statement, "we do not hide our feeling of repugnance towards him." 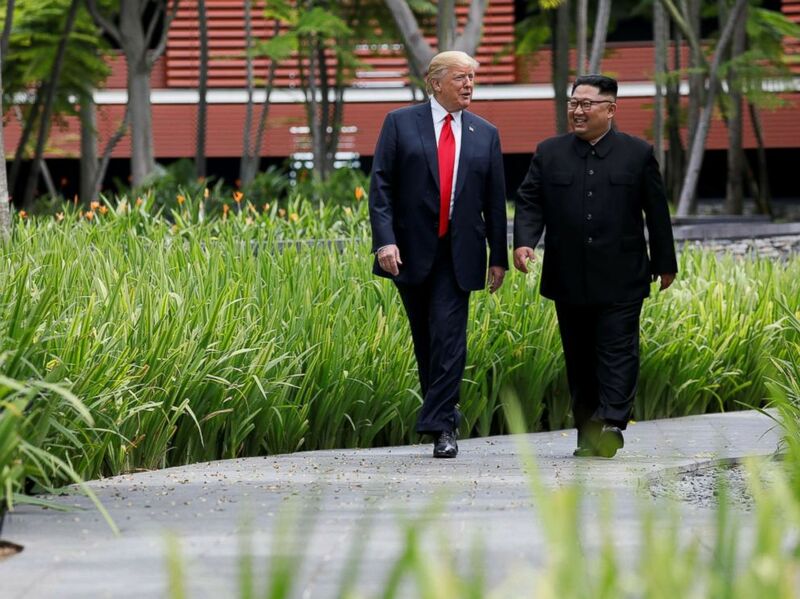 Forty-five minutes after going into their one-on-one meeting, Trump and Kim emerged and took a short walk together down a colonnade at the Capella Resort to a separate expanded bilateral meeting. 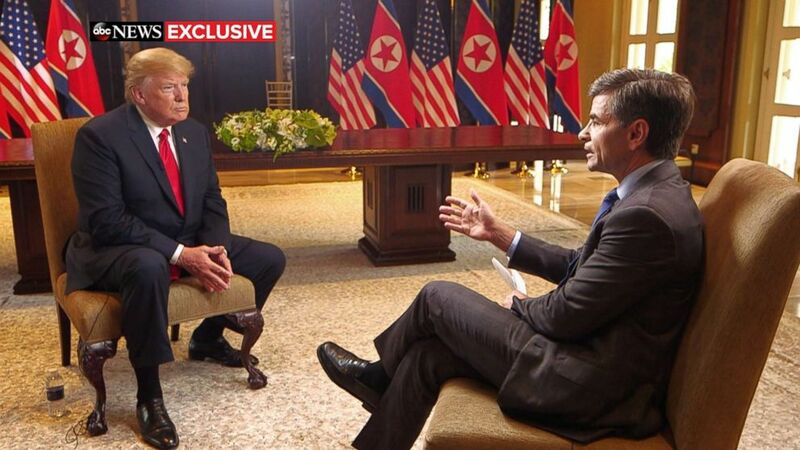 Trump shouted over a balcony to reporters that the private meeting was “very, very good” and said the two have an “excellent relationship.” Kim did not respond to shouted questions about whether he will give up his country's nuclear weapons. The two then sat down with their broader national security delegations for a second meeting. The president was joined by a translator and his chief of staff John Kelly along with Secretary Pompeo and Bolton. "I think things could work out very nicely," Trump said in a Tuesday meeting with Singapore's Prime Minister Lee Hsien Loong. The meeting marks the first ever meeting between a sitting North Korean leader and a U.S. president. 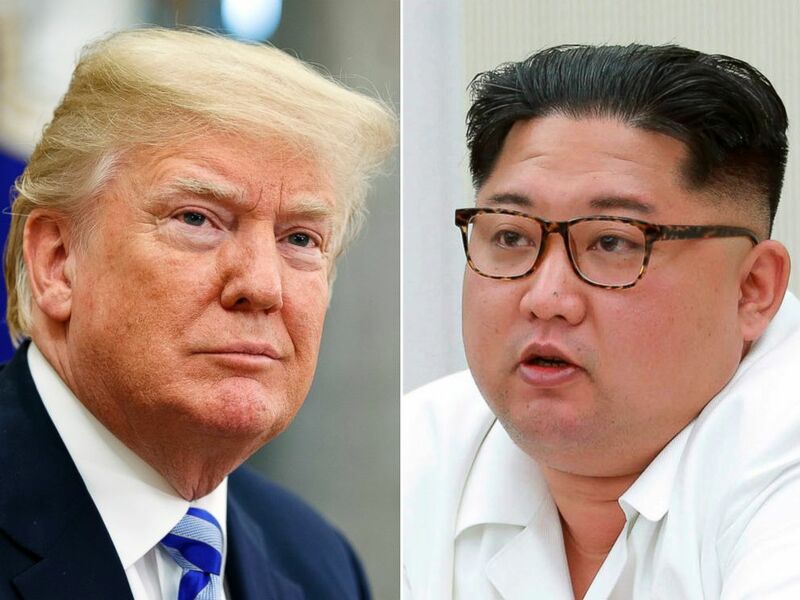 U.S. officials have said a best case scenario would be that it serves as a launching pad for negotiations that would provide Kim with physical security and his closed off nation with economic assurances in exchange for irreversibly dismantling his country's nuclear capabilities. While there has been a wave of bipartisan voices looking to support the president's efforts to avert war in the Korean peninsula, there have also been concerns in foreign policy circles that the meeting will elevate Kim's status as a brutal dictator overseeing a regime complicit in horrendous human-rights abuses. The White House has not said whether the president will raise issue with North Korea's dismal human rights record, but the president took time in the hours before his meeting to take a swipe at critics of the sit-down. Following their meetings, Trump will hold a media availability with reporters as Kim Jong Un departs back to North Korea. Even though President Trump had previously raised the possibility their summit could extend beyond just one day, the White House said Tuesday that the president planned to depart Singapore earlier than originally scheduled as negotiations with the North Korean delegation "have moved more quickly than expected." This combination of file photos show U.S. President Donald Trump, left, in the Oval Office of the White House in Washington on May 16, 2018, and North Korean leader Kim Jong Un during a meeting in North Korea, in the photo provided on May 18, 2018. In a briefing with reporters Monday, Secretary of State Pompeo did not set a threshold for whether there's any terms than North Korea would have to agree to beyond committing to further discussions that would make the summit a success. "We are hopeful this summit will have set the conditions for future productive talks," Pompeo said. "In light of how many flimsy agreements the United States has made in previous years, this President will ensure that no potential agreement will fail to adequately address the North Korean threat."